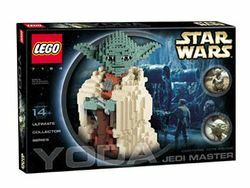 The set 7194 Yoda was released in 2002 as part of the LEGO Classic Star Wars Ultimate Collector's Series line. The set contains a large, brick-built model of the Jedi Master Yoda. It uses tan colours for Yoda's outer robe, orange for the inner robe, and sand green for Yoda's head and hands. It also uses brown to depict the Jedi Master's gimer stick which he holds in his hands, and black and white for the eyes. The head module is attached the the body with a turntable piece, so the model has the function of being able to make Yoda's head turn. A sand colored brick with the LEGO logo on it also comes with this set. Yoda was the Grand Jedi Master of the Jedi Order before the fall of the Republic to the Galactic Empire, which was ruled by the Sith Lord Darth Sidious, also known as Palpatine. After a duel with the Sith Master, Yoda fled, and settled on the planet Dagobah. Twenty-three years into the reign of the Empire, Luke Skywalker came to Dagobah, after being told by the spirit of his former Jedi Master Obi-Wan Kenobi of Yoda's whereabouts. Yoda trained Luke in the ways of the Force, however Luke's training was cut short when he received a vision of his friends being captured by Imperial forces. Two years later, Luke returned to Dagobah, however Yoda's health had drastically detiorated from last time the two met, and while Luke was with him, Yoda passed on and became one with the Force. Artwork which was used for the box. This page was last edited on 17 August 2017, at 02:04.